» The Void » Advertisements » Enemies Foreign&Domestic! 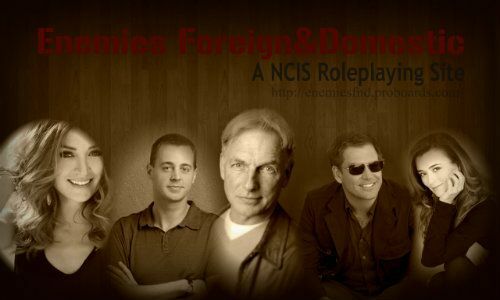 Enemies Foreign & Domestic is an AU (Alternate Universe) NCIS role-playing site, meaning anything can happen here! Have you ever wondered what it would be like for Ziva and Tony to hook up?! Or McGee and Abby? Or something crazier like Ziva and McGee! Well all your fandom dreams can come true here! We encourage you to be as creative as your little heart desires! "Shalom! My name is Special Agent Ziva David and I have worked with NCIS for five going on six years now! My partner is a Very Special Agent Anthony DiNozzo and my other partner is Special Agent Timothy McGee! Our boss is Special Agent Leroy Jethro Gibbs and he leads our team every week on new cases! Our job as NCIS agents is to protect the well being of Navy Personnel, Marine Corps and their families. We are very dedicated here at NCIS and hope that you can see that our persistence and dedication is to the fullest and in your best interest! I started here at NCIS as a liaison for Mossad, it was rough at first, my job description had changed from Assassin to field agent, apparently I didn't know the difference, I struggled trying to understand the difference between the two agencies, With NCIS I was there to help people and with Mossad I was trained to kill. The two agencies were unified by Director Jennifer Shepard who made a deal with my father, Eli David, The Director of Mossad, that she wanted a Mossad Agent as a Liaison to strengthen the relationship between the two agencies, to work off one another and protect both nations from enemies foreign and domestic. Director Shepard and I became good friends, we had a different relationship than the other agents had with her, it was more a friend to friend basis. Jenny is no longer the Director of NCIS but I still call her friend. I don't know if you all remember Special Agent Caitlin Todd? Well turns out she is alive and well! None of us really know her whereabouts but when we all found out she was alive and well we were more than thrilled, I didn't personally know her but I know she was important to the team before I came along. I do hope to make a friendship with Kate and perhaps she will rejoin us sometime! I wouldn't mind not being the only woman on the team! We have not seen Dr. Cranston in a while, I do not know whether that is a good or bad thing, I mean, No one likes a shrink hanging over their shoulder but I would have expected her to come around sometime soon? Nothing is impossible, the working women and men at our agency are dedicated to the people, to protect and serve the US Constitution and what it stands for. Will you join us? On our quest to rid the evil out of this world one murder case at a time? We hope to see some new faces around the building! So if you think you have what it takes then join us!